Rope Dimensions: 84" x 3/8"
WARNING: Cancer and Reproductive Harm - www.P65Warnings.ca.gov For more information go to www.P65Warnings.ca.gov. 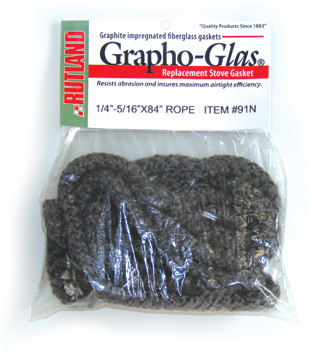 If it's time to replace the old cracked and worn gasket on the doors of your wood or coal stove-then this fiberglass Grapho-Glas Stove Gasket rope by Rutland is ready to fill the gap! This rope measures 3/8 in. x 84 in. and is braided to prevent unwinding and tangling. This graphite-impregnated rope means durability and is abrasion resistant, while withstanding temperatures as high as 1,000 degrees F. The black color of this gasket rope allows it blend in easily with your stove for a seamless and discreet installation. And don't forget to pick up some Stove Gasket adhesive to help get the job done!